Brighton and Hove Albion’s success in the quarter-finals of the FA Cup means that we now finally know how many teams will blank in Gameweek 33. The Seagulls came back from two goals down against Millwall on Sunday to force extra-time and penalties, running out 5-4 winners in the subsequent shootout. With the FA Cup semi-finals taking place on the same weekend as Gameweek 33, eight sides will be without a Premier League fixture that weekend: Brighton, Manchester City, Wolves, Watford, Spurs, Cardiff, Manchester United and Fulham. The article that went out yesterday evening goes into more detail as to the ramifications of the other three quarter-finals. As for Brighton, they had three top-flight fixtures that needed rescheduling as a result of clashes with the two domestic cups: Chelsea (a), Cardiff (h) and Spurs (a). One of those matches has already been rearranged. Spurs announced after full-time at the Den that they will entertain Brighton in Double Gameweek 35 and Crystal Palace in Double Gameweek 32. The fact that Chelsea are still in European competition means that the Seagulls’ outstanding meeting with the Blues could very well be rescheduled for Double Gameweek 32 (there are no Europa League ties in that free midweek). Albion’s home match against Cardiff would appear likely, then, to fall into a separate Double Gameweek later in the season. We will likely get confirmation of this in the next few days. We’ll have more on the Seagulls’ FA Cup quarter-final itself in our Scout Notes tomorrow. Have you tried looking at the price list? What is your perfect team? Or will new teams created be a transfer in? good point, the market seems to have slowed down though? Chelsea fixtures too good to not have a defender. Alli seems to be a reach. Bernardo's great in rl, not so much in Fantasy (but ok) -- why not a City D/GK instead? Could switch round Foster, Lindelöf and Alli to Ederson, Rudiger and Deulofeu for the time being? Whoops mean Silva out not Alli. Hmmmm....Ed, Rudi, Deu is better I think. If I have no free hit is it bad to not plan for the blank and bring in Chelsea assets or is it better to go for broke and get in Aguero and Bilva? bringing in chelsea assets does mean you're planning for the blank... am i misunderstanding you? I’ve done this, I have no free hit and have Azpilicueta/Hazard and Sterling..
Oh bugger it. Gonna use FH tonight. At the risk of repeating others earlier today... Thinking of activating the Free Hit tonight to guard against price drops. Good idea? There’s no real danger of these doubles not happening, is there? Sterling is going up, Salah is dropping tonight. Salah to Sterling is a move I’ll be doing. Maybe just do it as the FT for the week and then activate FH later? Sterling definitely not going up tonight. Salah may drop. I wouldn't be so sure that Jimmy will be rotated.. Maybe Wolves MVP right now..
How come ITV4 HD has the Barca La Liga game? Had 34(-4) with 11 players and TC. Guy in mini league got 34 with only 3 players including cap mane. That Mane rubbish on Sat morning cost me a huge leap! That mane rumour has cost a lot of us big time, very harsh indeed. That is so annoying, similar situation for me in my ML, planned really well for bgw31, ended up with 29 points! Worried about Jimi rotation though if honest. Shaw on 9 yellows so perhaps Lindelöf- Assume you mean Aguero and not Austin! Salah: 8 points (goal and an assist) from last 8. Is he really with the price and arm band each week? No. Im off the boat. He looks so frustrated. Obviously not. I think he is gone for most teams in gw 33 or 34. Haven't checked but wonder if thats due to other players not doing well in general? 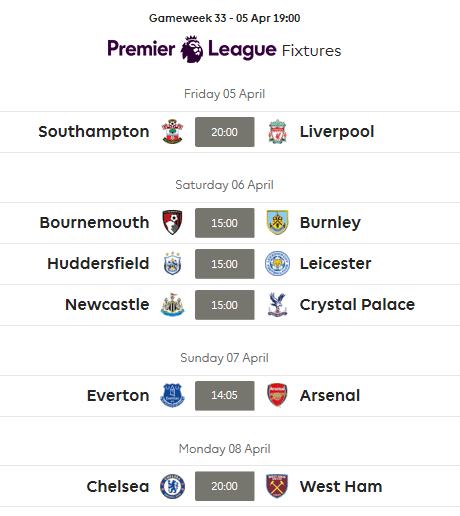 When will FPL confirm extra games for GW32? Always some kick to see 2 games under the players, not to mention full squad, agree? What have we learned from the "Mane-not-in-pictures-gate"? That we never learn !! To look harder next time. Wait for a second piece of evidence and dont go off half-cocked! Set your team up early & do not touch it, would be 40 pts better off this week alone! Liverpool plays higher defensive line, Palace not watertight exactly. How about Son instead of Higuain (352 instead of 343) ????? Mane is doing well but a single game week against Spurs? No thanks..
who would you bring in for Mane? If u plan well, bgw are good. I got 53 points. ( No free hit. Captained Mane. Thoughts on this -4 team and maybe a TC? Or does it need a FH? I made a big blunder getting Higuain in for Jimenez 2 weeks ago instead of Vardy. Question do i keep Higuain for the likely dgw against Cardiff and Brighton or ship him? Chelsea look rubbish. Free Hit for 32 or ?? No. FH already used. No WC either. Only TC and BB remaining. You gotta keep then...surely other fires to address with your limited transfers for rest of season? Who knows. All I can tell you, as a Chelsea fan, is that he is unlikely to complete the full 90 minutes in either of those matches. I slowly swapped hazard back in, and just shipped Higuain today.. Took a (-12), thankfully brought in Mane so probably netted 4/5 points. Will get me 9 DGWers and 9/10 in BGW33, thoughts? Don’t have much value tied in VVD and will potentially mean no Salah for the home stretch. Which mid would you have sacrificed? Interesting. I don’t watch football, at all. Take most of my information off here. Didn’t see anyone mention why Maddison took his shirt off. No wonder my season is dire when people are picking out details like that. What was on his t-shirt under his kit? All I saw was “idiot”, “hahaha owners”, etc. Yep. There are some decent posters on here, but generally the quality is much worse than when I last played (2015/16). There was a site back then, maybe totalfpl or something. It was cancerous. I think FFS is becoming something like that was. And that’s an awful time to use the C word, apologies. I was being polite, it's much worse which is a shame as available data and analysis is better. Totalfpl - yep that was the chat box from memory. Final season for me here I think, at least for FPL (may still chat about Eliteserien if that's still sandboxed away). Cancerous is maybe unfortunate timing, but it's ok to refer to an evolving affliction with approriate terminology. How is my FH team looking? I don't rate higuain . Giroud morata and him . All useless.Chelsea really have to get their act together. Is Guaita likely nailed for both CPL games, or is he a significant rotation risk? Any estimations on when the ranks update? Ta. Che's DGW will be vs?